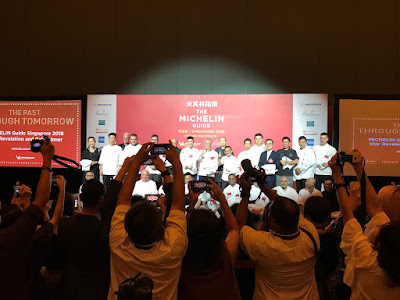 After I booked my plane ticket to Singapore, a food writer friend there told me I would be there when the Michelin announcement would be made. Why not go? It was held tonight at Resorts World Sentosa, this massive complex that houses a casino as well as Universal Studios, about 20 minutes from the city centre. The event started late (of course) and finally they announced which restaurants received one star. There are 34 this year, five of which are new. This year the chefs were given chef jackets, not a copy of the guide in previous years, which was pretty tacky. After they were feted on stage in the ballroom, the chefs were ushered into the media room where photographers and reporters wanted to get their pictures too. It was a mad rush -- much like it is in Hong Kong -- with everyone using smartphones or proper cameras to get a shot. I much prefer getting a picture of them getting the picture. It just shows how excited everyone is. In the end five restaurants were coveted with two stars (the same ones), but no restaurant was given three stars, as the current holder, Joel Robuchon Restaurant, will close next month at Resorts World Sentosa due to financial difficulties.